The disciplined use of car dealer Ups log books (Ups stands for follow-"ups" on prospects) from Estampe Car Dealer Supply is a great way to increase sales without spending more money. Or, put another way ... NOT ... using car dealer Ups logs is a great way to WASTE your dealerships advertising dollars. The money you spend on advertising helps bring prospects to your car lot and show room, so be sure to use car dealer Ups logs to make to most of that investment. Car dealer Ups logs should be used to record and track all walk-ins and phone-ins. Your dealership's Ups logs should be reviewed daily, and the previous day's activities should be check to be sure no opportunities have been overlooked. The disciplined use of car dealer Ups logs is also important in determining closing ratios. Using car dealer Ups log books also helps to collect information you can use to analysis the market demand for used cars and gauge the average asking price. This Auto Sales Guest Register Prospect Book is a great information management system. This book provides detailed information on each prospect with a plan of action section for future follow up. This Auto Showroom Sales Contact Report Form will help keep track of prospects and potential buyers. 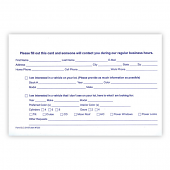 This form captures all the important information that you need to help sell more cars. This UPS Log Book/Customer Contact Log book is specifically designed for auto dealer sales and helps turn prospects into customers. It's very important to keep track of your daily closing ratios. This log-book will help you monitor and improve your showroom closing rate and keep track of walk-ins and phone-ins. These heavy duty Customer Lead Cards are great for keeping track of potential customers to visit your dealership's showroom. Capture customer name, contact information and vehicles of interest in this simple to use card. Cards can be used in auto sales offices or After Hours Shopper Box. Auto dealers around the country are required by law to keep a detailed record available for immediate police inspection of each vehicle bought or sold. These are commonly referred to as Police Books. Our Police Book is hard cover bound and allows you to keep a record of each vehicle handled by your used car dealership.